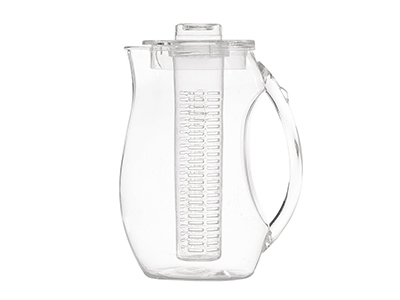 Fruit Infusion Pitcher-Clear Tea Fruit Infusion Pitcher,Best For Infused Lemon, Fruit, Herbs Or Tea Beverages. Water with naturally awesome flavor infusion. 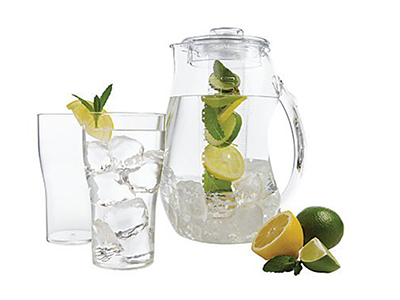 Add some fresh fruit or herbs to your hydration process with the Infused Pitcher and always have an exciting beverage on hand. our infuser works equally well with vodka or sangria. Mocktails and cocktails in one handy pitcher! Fruit Infusion pitcher has removable hollow rod that can be filled with fruits, citrus wedges, herbs, or savories Open slots in rod allow contents to naturally combine with liquid; rod screws into lid, so it stays securely in place Clear acrylic allows for enticing view; pitcher looks great on a well-set table; may be continually refilled without replacing fruit. includes the Fruit Infused Water Pitcher, removable infuser tube, freezable ice tube. 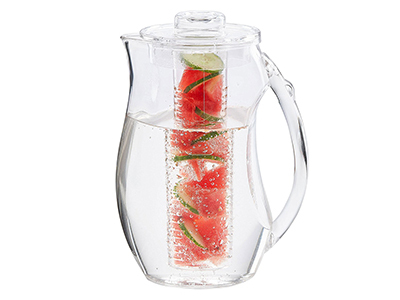 This fruit infusion pitcher features an easy-to-grip handle. Infuser core can be filled with fruits for your naturally flavored drinks of choice. 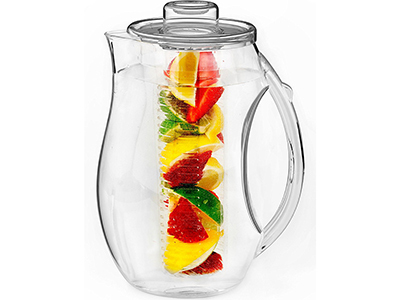 Fruit Infusion pitcher has removable hollow rod that can be filled with fruits, citrus wedges, herbs, or savories Open slots in rod allow contents to naturally combine with liquid; rod screws into lid, so it stays securely in place Clear acrylic allows for enticing view. Ice core is ideal for cooling your favorite drinks.Good way to keep drinks cool.Both infuser tube and ice core are removable. The plastic is crystal clear and the shape looks great. It was a tad smaller than I expected but in hindsight that's great because it will be convenient and easier to pour. I'm excited to try some new recipes for infused water! This is one of my most used products in my kitchen right now. When i first got this i purchased some cucumbers and strawberries. I am very please with the quality of the product. The plastic is thick and seems to be of great quality. I am having so much fun coming up with different flavor combinations.Working wonderful. Makes really good fruit tasting water. 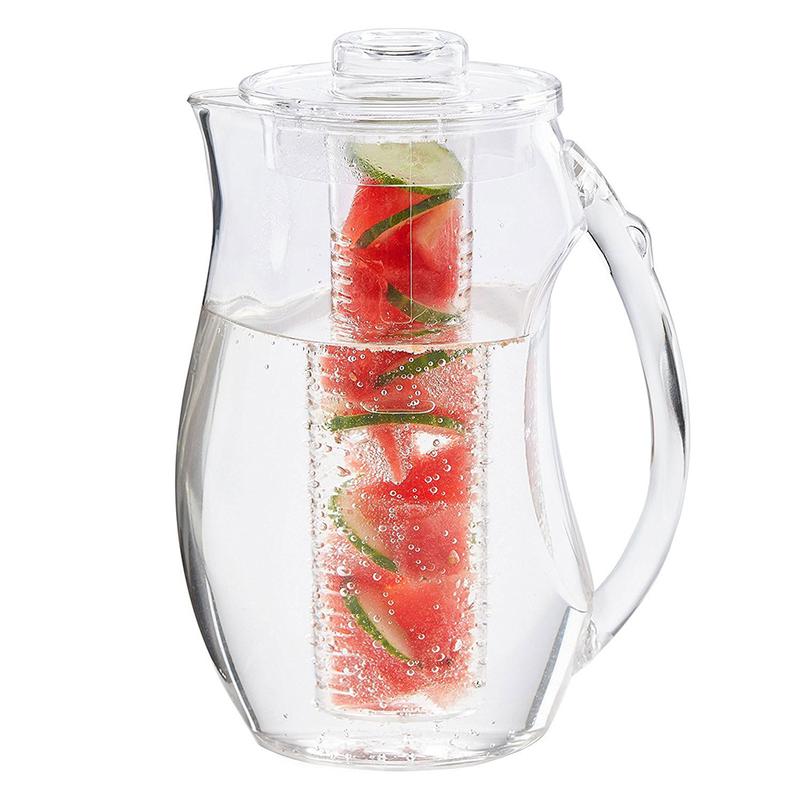 Beautiful water fruit infuser pitcher! I love that there is a big enough pitcher to make fruit infused water. I couldn't find one that I liked that didn't hold more than just a water bottle of water- until now. I love that I can leave it in the fridge and the kids can help themselves to it all day. Its a great alternative to sugary juices and sodas. Very easy to clean also. This is a great quality product. I've used it everyday since I received it and absolutely love it!